Alpaca open days are a great opportunity to meet some alpacas and enjoy a farm walk followed by homemade cakes and locally roasted coffee. This is a Family friendly event but young children need to be closely monitored since we are a working farm and there is a large lake among other ‘attractive’ areas. While we love dogs, they are best left at home since they are not helpful around the alpacas for obvious reasons, plus the car park is not shaded. Come prepared (see helpful list) for muddy farm tracks with comfortable outdoor clothing including waterproofs for Welsh weather. Appropriate footwear – wellies or walking boots are best. Baby buggies will find it a challenge. Entrance is FREE but we never turn away donations towards refreshment costs! Come and join us for an Alpaca Open Day for all things alpaca. Alpaca open days are a great opportunity to meet some alpacas and enjoy a farm walk followed by homemade cakes and locally-roasted coffee. If you are interested in seeing alpaca fleece, talking about its use and chatting to others with an interest in alpaca fibre then pop in for coffee and cakes during our open house event on Saturday 22nd November, 11am-3pm. We will also have alpaca socks for sale – great idea for Christmas presents – and examples of wet felting. And of course the alpacas will be on hand…or at least in the field! For those who were able to make the recent open day, it was great to see you. I just wanted to remind you of our next event on 13th September, which is an alpaca discovery day. It will be a fun and informative day and a great opportunity to learn about alpacas and how to keep them, as well as have more close up contact with them. 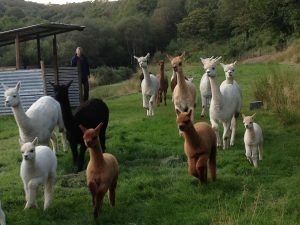 Ideally suited for those who are thinking of owning their own alpacas, it is also aimed at those who just want to be around them for a day. Met your first alpaca already and want to spend more time close up? Thinking of owning your own alpacas? Want to know more about these fascinating creatures? If you answer to any of these questions is yes, then our Alpaca Discovery Day is just for you. We cover the basics about alpacas, their needs and how to meet them, health issues, business opportunity etc. We keep the numbers small enough on the course to ensure you get enough time with the animals and so that your questions can be answered – even the ones you didn’t know you had yet. Cost: £25 per head includes refreshments and lunch and course notes. Venue: on farm here at Ty Blaenant Ddu in Swansea.